I'm very excited about a new challenge I'm about to start! It's being issued by Trudy, and it's based on the book, The Artistic Mother. I know that I often struggle to balance my own family life and creative time, so I'm excited to work with some other moms, and especially to see what they create! I am so thrilled that you are joining The Artistic Mother's Group. We will be allowing two weeks for each project. But if you get behind, please don't worry. Just keep working a little each day. The whole point of this group is to develop the habit of doing art each day. It is also so we can encourage one another and be an accountability group. I personally need the accountability part of it. Knowing that others are coming to see what I'm up to is very motivational; otherwise, I may not finish it on my own. Some projects may be easier for you than others and may allow you to catch up. But if you don't, don't get discouraged. Just keep on going. This is a low pressure group. I want everyone to have fun and also enjoy visiting one another. Each week do a post of your progress as you go through the book. Please either include links to the other participants in your posts each week or keep them posted in your side bar or you can give the link to my blog in each progress post stating that the master list is on my blog that way everyone can click around and visit all of the other participants' blogs and see everyone's progress for encouragement, inspiration and to encourage. A real easy way to do the linking would be to have a separate blog list from your main one labeled The Artistic Mother Group and keep all of the participants on that list on your sidebar. Then you don't have to put the links in every progress post. That's what I'm going to do. Each progress post I make, at the end of the post, I will list any new participants. So please check my blog each week for the new comers so you can update your participants' list. Other things to be doing before we get started: Buy the book if you haven't already, start reading it, start gathering a stash of papers: newspapers, magazines, flyers, ticket stubs, scrap booking stickers, etc., to be used in future projects. The first project will have us making background papers. Be sure and check my blog often for updates and notes of encouragement. I am signing up as follower and putting you on my blog list so I can know when you post, and I am adding your name to the list right now. Again, I am so glad you could join us. See you on March 6th, our launch date. Note: Due to copyright laws, we are not allowed to do tutorials or step-by-step photos of the projects on our blogs or take photos of the pages in the book and post them. You may post a photo of your version of the project and talk about your experiences and feelings relating to it. Also, if you are doing this project with a friend, each person must have their book unless you are doing it together under the same roof. No photocopying of the book, please. I have a special message for participants of The Artistic Mother's Art Group on my blog. I will be posting regular updates, tips for doing the projects and notes of encouragement. One of the future postings will be about the upcoming Flicker group for participants. I will have information for alternative ways the projects can look like and so many other things. There is a possibility that our group may be featured in a major art publication at some point, which will go unnamed at this time. We are going to be featured at Designing Moms soon. Everyone will want to post photos of their best work on their blogs because these publications may choose photos of some of the participants' work. I will do a post soon on how to take great photos to help you best showcase your work. I cannot possibly contact each participant individually when something important arises; so if you could check my blog often, that would be great. I don't want you miss anything. To make it easier for yourself, you could add my blog to your blog list. Then you will see when I have posted and you will know when to come. Tomorrow I will have tips for doing the first project. 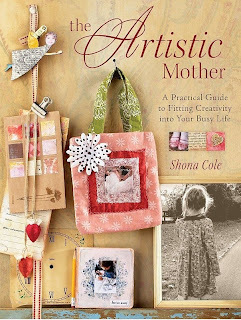 I posted a message today about getting started on The Artistic Mother workshop. Thank you again for being a part of this group. I know we will all get so much out of it and learn how to balance family and art time.